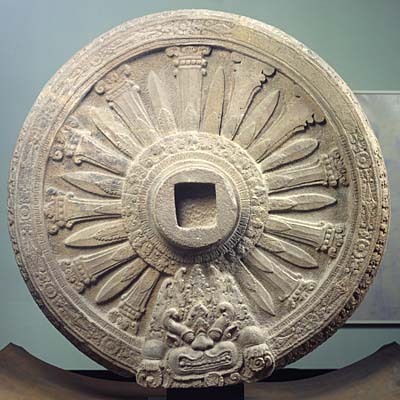 This Wheel of the Law, characteristic of pre-Thai Dvaravati Buddhist art is decorated withfloral and plant motifs and small flames on the bracket. Although dated from the 8th century AD, the lion head (simhamukha) in the lower section of the work, as well as the lavish decoration, would rather suggest the following century. Wheels of the Law sculpted in the round were extremely important features in ancient Indian art, and many examples are found in the art of the Dvaravati kingdom from the 7th century. This type of piece has connotations of the Buddha’s first sermon in the Deer Park at Sarnath near Benares, an interpretation reinforced by the discovery during excavations of deer figures in the round close to some wheels. Such wheels generally stood on a base on the top of a pillar symbolizing Mount Meru, the axis of the world crowned by the palace of Indra, king of all the gods. This work is to be placed within the complex historical context of ancient Thailand which consisted of several kingdoms including that of Dvaravati. From the late 13th century, the foundation of the Thai kingdoms- Sukhothai, Lan Na -was to have profound consequences for the history of the region.